In a totally unscientific anecdotal analysis, I have found that child neurologists are the most caring and empathetic physicians of all specialists. Unfortunately, most of us have neither the time, the training nor the resources to provide comprehensive care for all of our patients with severe neurological impairment. 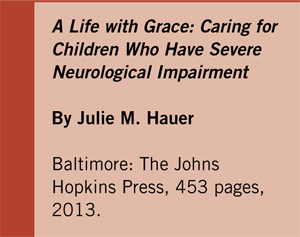 A Life with Grace; Caring for Children Who Have Severe Neurological Impairment goes a long way in showing that it is possible to act collaboratively with parents and other members of the care team in order to provide a humane and realistic approach to intellectual disabilities and other static and progressive encephalopathies. This book may be directed at parents and caregivers, but it strikes a responsive chord in many health care providers like myself who accept and encourage a family-centered approach that redefines palliative care far beyond end-of-life support. Rather, it can aim to ensure the best possible quality of life for the child while accepting that medicine does not have all the answers. And even when we think we know the right approach, it is essential to accept families as partners in the decision-making process. The most successful chapters are symptom-oriented discussions such as pain, seizures, GI complaints and respiratory problems. It doesn’t matter if the underlying diagnosis is Trisomy 21 or Rett syndrome since identification of a disruptive symptom such as pain and its differential diagnosis is similar in all neurologically impaired children who cannot communicate or even localize the problem. The author is frank about her opinion that favors an empirical approach, which minimizes testing and offers treatment based on likelihood of diagnosis and availability of effective non-invasive interventions. At the same time, Hauer suggests that there is a role for intensive investigations if the symptoms persist despite the first steps. In a book written to a lay audience, there is a plethora of information including worrisome side effects and drug interactions, but little advice on how to prioritize among choices — while confusing, this is reasonable if one understands that expert diagnosticians must look at the individual child and negotiate the options with skill and finesse. She also offers some practical algorithms for specific symptoms (with validated scales where available), a time frame for the recommended clinical trial, the importance of regular assessment of outcome and a sensible guide to discontinuing medication when the treatment has failed to achieve its goals. Perhaps equally important is the emphasis (both to parents and neurologists) on non-pharmacological approaches from simple comfort measures such as massage, repositioning and reduced total volume with slower tube feeding to alternative strategies such as acupuncture. Child neurologists may particularly appreciate the discussion that recognizes that almost any CNS symptom (from spasticity to dystonia to seizures) can worsen as a result of any factor altering comfort — pain illness, constipation, disrupted sleep, medication toxicity, etc. It is equally important to recognize that many behaviors that could be seizures in children with severe neurological impairment (even in those with definite epilepsy) have non-epileptic explanations for their arching, posturing, exaggerated startle reactions and staring. The chapter on seizures is valuable for child neurologists with recommendations for tube-fed children, guidelines for rectal administration of drugs and the restrained use of blood levels. One disappointment is the brevity of the discussion on medically refractory epilepsy in this population. I would have preferred to see more emphasis on surgery since this is still the only real option for cure. Even though limited resection is less likely to be successful in severely involved children, there are many examples of excellent outcomes in selected cases of tuberous sclerosis and cortical dysplasia in patients with intellectual disability and autism. Beyond focal resection, it is equally important in a book emphasizing quality of life to more fully discuss the value of the ketogenic diet, vagus nerve stimulator and corpus callosotomy — all of which can be life-changing in the well-chosen patient. The least successful chapters come early in the book – what I call Neurology 101. Indeed, it is necessary to review static versus progressive disorders, but to highlight a handful of examples trivializes the complexity of the diagnostic challenges and is confusing in the overlap of distinguishing symptoms. In the era of molecular genetics and pharmacogenomics, it is insufficient to list 12 random genetic disorders or to spend two pages explaining brain pathology in children with all of the conditions that can lead to severe neurological impairment. There are many valuable points that can help the treating neurologist in areas that are at the edge of his or her knowledge. These include GI issues from the risk of diarrhea from excessive sorbitol in liquid medications to constipation not only as a source of pain, but also as a cause of urinary retention and bladder infections. In addition, there are consequences of delayed GI motility including distension, abdominal pain and chronic diarrhea. There are equally valuable pointers in the respiratory chapter such as techniques to manage dyspnea from stimulation by a fan to repositioning and use of benzodiazepines to reduce anxiety as well as the recognition that treatment of excessive secretions with anticholinergics must balance the goal of reduced secretion with the risk of thicker secretions that are more difficult to mobilize and can worsen constipation. Particularly helpful for physicians as well as parents are the case examples spread throughout the book. These address the decision points that go into a fully informed plan to address critical issues like whether to perform tracheotomy or spinal surgery, how to manage recurrent respiratory crises and even withdrawal of support respecting life without extending death. In summary, this is a unique and valuable resource for parents and neurologists alike. It beautifully manages the almost impossible by speaking at a high level without excessive scientific jargon and incorporating a glossary of medical terms for the laymen while including timely and extensive peer-reviewed references at the end of each chapter for physicians. Brown is at the Children’s Hospital of Philadelphia, Philadelphia, PA.
2012 APAYNET workshop participants in Melbourne, Australia. Young neurologists, future advocates of the brain are ready to embrace the 2013 WCN congress theme, globalization of neurology. We agree with Vladimir Hachinski that neurologists are the true guardians of the brain. The International Working Group of Young Neurologists (IWGYNT) held its inaugural meeting at the 2009 World Congress of Neurology in Bangkok and is ready to embrace the concept of globalization. We represent the common interests of young neurologists and neurologists in training worldwide within the World Federation of Neurology. IWGYNT continues to establish and foster networking between young neurologists and trainees across the globe. We wholeheartedly support international exchange programs across the globe. In 2009, panels of delegates were organized to represent each continent (two delegates per continent). These delegates continued their hard work to achieve the mission representation, networking and exchange programs for young neurologists and trainees. 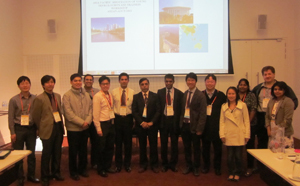 Asia Pacific Association of Young Neurologists and Trainees (www.apaynet.org) was born as a result of IWGYNTs advocating for international young neurology. APAYNET continues to be the only organization in Asia to specifically represent the interests and young neurologists and trainees in Asia Pacific region. We were following the footsteps of European Association of Young Neurologists and Trainees (EAYNT) who were quite successful in this mission in Europe in the recent years. Young neurologists need good clinical training. Not all centers in Asia Pacific region have the necessary facilities to train young neurologists in their area of interest, so the trainee may have to spend time in another country. Our group will try their best to facilitate this process to make improve post-graduate training across the region. Since 2011, APAYNET representatives delivered lectures and workshops on matters for junior neurologists and trainees at local and regional meetings. In 2012, there were two major activities. APAYNET was invited to represent World Federation of Neurorehabilitation (WFNR) young neurologists interest group at the 2012 WFNR congress in Melbourne. Tissa Wijeratne chaired the workshop, which focused on post stroke spasticity. It was a huge success: 15 trainees participated; delegates from several Asia Pacific countries were present. The participants enjoyed the workshop. The inaugural APAYNET workshop, chaired by Wijeratne, conducted in conjunction with the 13th Asian Oceania Congress of Neurology in Melbourne in 2012. The workshop opened by an online presentation on neurology training and teaching in Europe, journey of European neurologists and trainees by Walter Struhal, Bruce Campbell from Australia and New Zealand, Surat Tamprawate from Thailand, Hans Tu from Royal Melbourne Hospital and Western Hospital, Jong Seok Bae from Korea and Hemal Horadagoda from Sri Lanka. Arthur Wesley Thevathasan, a young upcoming star in the movement disorders field in Melbourne from Australia, Professor Man Mohan Mehindiratta from India were among the speakers. One main issue of this workshop is how to create more training and learning opportunities for the young neurologists and trainees in the region. Stroke is the leading cause of adult disability in Sri Lanka, which has a population of 23 million. Sri Lanka health care workforce is trying their best to improve stroke care in the country to keep up with the rest of the world in the recent years. There is a strong need for ongoing stroke care training and education in Sri Lanka to enhance this process further. 2013, APAYNET conducted a series of stroke master classes in Sri Lanka. The World Stroke Organization endorsed Stroke Master Class series in Sri Lanka. Wijeratne, Darshana Sirisena (Young Neurologist from Sri Lanka) and Nirodha De Silva (young physician with an interest in stroke from Sri Lanka) were the key organizers. All aspects of stroke care and management were covered during the stroke master class series. Despite a lot of challenges, more than 500 Sri Lankan doctors, nurses and allied health staff took part in this highly successful stroke master class series. European neurology is in the process of increasing harmonization. This is a consequence of the right of European neurologists to practice freely in Europe. This implies practically and scientifically based needs to approach the issue with care and preparation. Presently the UEMS/EBN (European Union of Medical Specialists-Section of Neurology/European Board of Neurology) provides a core curriculum for neurologic training, a definition of the neurology speciality, a training center visitation program and a European Board examination. The UEMS (www.uems.net) is the union of European medical specialists, and is constituted of representatives from national societies and sections. The European Board of Neurology has representatives from European UEMS members and has biannual meetings. The website of the UEMS/EBN contains information of present activities, including that on examination and visitation of departments. One of the main activities of the UEMS is education. The UEMS/EBN also has provided a core curriculum, a definition of neurology within the UEMS, in addition to the department visitiation program and board examination, and is active in the accreditation of CME activities. The content of neurology training for residents varies in different European countries of Europe.1 This is not only depending on national traditions, but mainly on the way neurology is practiced and how health system structures are used. In addition, local and national health systems have different professional relations with related overlapping medical fields. Pediatric neurology is in most countries attached to pediatrics. The definition of European minimal standards of content and structures of neurology are available in the UEMS/EBN chapter 6.2 The Core Curriculum of Neurology has also been published previously3 and is now (2013) in the process of revision. Practical skills are trained mostly within the core competencies of neurology such as stroke, extrapyramidal diseases, multiple sclerosis and epilepsy.4 Some disciplines, such as clinical neurophysiology, may not be part of the neurology curriculum in several countries, but are still practiced by neurologists or specially trained neurophysiologists (in some countries with a separate specialty in clinical neurophysiology). Skills and particular competences will become more important as future stroke therapies with interventions also need the participation of neurologists.5 Rotation and exchange of trainees are also encouraged by the UEMS. Many European sections, like urology, anesthesiology, ophthalmology and others have developed a European board examination, which in some countries in part or as a whole has replaced the national examination. The attendees of these examinations have to prove that their knowledge is at a European level, and can use the examinations a sign of quality and excellence. The UEMS-SN/EBN decided to develop a European Board examination in 2004, and after several years of development the first examination took place in Milan 2009 during the ENS congress. The choice of the instruments of the examination is difficult and much debated within the medical disciplines. This concerns the source of questions, the format of the examination, the examination format and the evaluation of results. At present, no universally applicable format of examinations is offered by the UEMS/Council for European Specialist Medical Assessments (CESMA),6 and the development of questions often depends on the individual section constructing these examinations according to their needs and requests. It was decided that an instrument for reliable and objective testing of skills and practical issues would not be feasible within the neurology examination format, and therefore only candidates were accepted from EU/European Economic Area (EEA) countries, who had already been trained, or were declared qualified for the examination by their national society. These European candidates are conferred the title “Fellow of the UEMS/EBN.” By 2013 also applicants from non-European countries were admitted to the examination provided they could present proof of similar qualifications. 2: A set of 120 multiple-choice questions (MCQs) with one single best answer has been the main part of the examination. The MCQs were provided by members of the UEMS/EBN, the large European neurological societies (EFNS (European Federation of Neurological Soceties) and ENS (European Neurological Society (ENS), other neurological societies (Movement Disorder Society, European Stroke Society)) and recently also e-brain. Before the examination all questions were graded independently by an examination board in a specific database. Only questions that obtained an average score over 5 (range 0-10) were accepted. The quality of questions and options of answers were then assessed by members of the Department of Medical Education, Ege University, Turkey, chaired by Prof. Ayhan Caliskan.7 This examination quality assurance concentrated on question stem, clarity, language, ambiguousness, and flaws. The final editing of the accepted questions was performed by the chairmen of the examination committee, who also distributed the number of MCQs to different topics. 3: Until 2013, the examinees also had to sit at an oral examination which consisted of four case vignettes with structured questions/answers. The oral examination was replaced from 2013 (examination in Barcelona) by EMQ (extending matching questions). The major advantage of EMQs over MCQs is that this format not only evaluates knowledge, but also clinical reasoning. The EMQ case scenarios have been developed and written by experts in various topics on a given problem. 100 scenarios were prepared for Barcelona. The passing limit of the MCQ questions, oral examination, and of the case presentations has been set to 75 percent in the first series of examinations. From 2012 onward, a passing limit was determined by an evaluation panel the day before the examination, based on the Nedelsky and Angoff methods. This represents an additional effort to optimize the procedures according to educational standards. Finally, the trainees need to orally present a case, and they thus earn extra points. This is a strictly oral presentation lasting 5 minutes, which is judged by two jurors according to a scheme. In the creation of the EBN examination, several practical questions had to be solved. The organization, including a database of questions, communication and practical aspects of the examination were handled by a professional company, the Vienna Medical University-affiliated Vienna Medical Academy.8 The examinations have taken place during the European neurological congresses and the societies (EFNS and ENS) have provided the necessary rooms. This has served the purpose that the examination could be combined with a congress visit. The cooperation with the societies has demonstrated their interest and engagement in the UEMS/ENB and the European board examination. In addition to sufficient rooming also secretarial staff from the ViennaMedicalAcademy have been present, and in addition handled the computer analysis of the MCQs and EMQs. As a routine, a full report of the recent examination is presented to the board of UEMS/EBN with regard to participation, questions, feedback of participants, the examination committee, assistance from the EgeUniversity and ViennaMedicalAcademy, and economical aspects. In recent years, the development of European board examinations as a sign of quality and toward a move to harmonization has been encouraged. The UEMS group called CESMA (Council for European Specialist Medical Assessments)6 has been established, and has regular meetings to work on the format and quality of European board examinations. The UEMS/EBN received initially two grants from the ENS and EFNS as a contribution to develop the EBN examination. All other costs have been covered from the resources of the UEMS/EBN, which has its income mostly from member fees (national societies) and by fees paid by the candidates, which do not cover by far the organizational expenses. The largest academic input and development was done by volunteers of the UEMS/EBN and many European specialist, who wrote questions, helped to prepare the examination, and also practically participated in several tasks. Several countries (like Norway) have implemented department visits on a national basis. This concept, also adapted from the UEMS, means a voluntary visit at a training center, both by a representative of the UEMS as well as of the national medical representation. It is a structured approach to evaluate departments in the sense of equipment, staff and resources, and is based on a questionnaire with assessment of teachers, residents, head of department and also representatives of the hospital staff. The final report analyses the different aspects of teaching and training, and gives recommendations that can be used and should be implemented by the department or hospital. Subspecialties develop in neurology worldwide. In the US, about 25 subspecialties fields have been identified and are recognized by the United Council for Neurological Subspecialties (UCNS), 9 which also provides an examination and certification system that is open worldwide. Within European neurology, no formal subspecialities have been identified. A possible step in this direction might be the attempt to create a multidisciplinary approach towards interventional neuroradiolgy by the division of neuroradiology of the UEMS. Since the publication of this paper, the EMQs and also the participation of non-European participants have been successfully implemented. A possible future cooperation with the Royal College of Physicians (UK), which offers similar examination, is under consideration. Neurological training is based on a curriculum, on training content, methods, and also finally an assessment and certification. One could argue that structuring an exit examination at the end of training may be counterproductive, as it is too late to correct training or detect deficiencies in the individual trainee. The establishment of a quality circle, which not only evaluates trainees but also the quality of training center, is therefore a further important step in European neurology. The implicit aspects are that a European examination increases harmonization, and the hope is that many European medical associations partly or as a whole will replace their board examination with this European examination in the future. 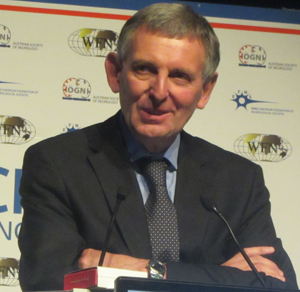 Grisold is a neurologist in Austria, chair of UEMS/EBN examination committee and trustee of the WFN. Mellgren is a neurologist in Norway, co-chair of the UEMS/EBN examination committee, Norwegian delegate and vice president of UEMS/EBN. Struhal is a neurologist in Austria, active in education in the YNT and EAYNT. He is a member of the education committee of the WFN. 1. Grisold W, Galvin R, Lisnic V et al. One Europe, one neurologist? Eur J Neurol 2007; 14(3):241-247. 3. Pontes C. Recommended core curriculum for a specialist training program in neurology. Eur J Neurol 2005; 12(10):743-746. 4. Struhal W, Sellner J, Lisnic V, Vecsei L, Muller E, Grisold W. Neurology residency training in Europe–the current situation. Eur J Neurol 2011; 18(4):e36-e40. 5. Flodmark O, Grisold W, Richling B, Mudra H, Demuth R, Pierot L. Training of Future Interventional Neuroradiologists: The European Approach. Stroke 2012. Sri Lanka has an aging population with an impending epidemic of stroke at hand.1,2 Stroke is a leading cause of adult disability in Sri Lanka3,4. The first stroke master class series conducted in Sri Lanka was launched in April and July 2013. The master class series covered five provinces (nearly 10 million population) and conducted in teaching hospital, Anuradhapura, teaching hospital, Peradeniya, provincial general hospital, Kurunegala, provincial general hospital, Ratnapura and district hospital, Diyatalawa. This stroke master class series was the latest initiative of Asia Pacific Association of Young Neurologists and Trainees (www.apaynet.org), the Asia Pacific section of International Working Group of Young Neurologists and Trainees (IWGYNT), World Federation of Neurology. APAYNET was established in 2011 as a result of the success of European group of young neurologists and trainees, European section of IWGYNT5,6,7. The stroke master class series comprises of 11 didactic lectures covering key topics of stroke care range from global burden of stroke, development of stroke services in the limited resource setting, classification of stroke, stroke imaging (master class on interpretation of acute stroke imaging), stroke thrombolysis, primary and secondary prevention of stroke, long-term rehabilitation in stroke. The syllabus ranges from basic science to recent advances in stroke care. This series was endorsed by World Stroke Organization and aptly supported by a major donation of printed educational material from National Stroke Foundation, Australia. The Stroke Master Class series was conducted by Associate Professor Tissa Wijeratne, Sri Lankan born, Australia and New Zealand trained neurologists currently reside in Australia, Darshana Sirisena, neurologist from Sri Lanka who is also the Sri Lanka representative of Asia Pacific Association of Young Neurologists and Trainees, Nirodha De Silva, physician with a special interest in stroke medicine and also the director, Stroke services, Base hospital, Diyatalawa, Sri Lanka. The series was aptly supported by several Sri Lankan neurologists and few senior physicians in Sri Lanka. Diyatalawa Stroke Master Class audience. Despite several challenges, the master class series was a huge success. There were more than 500 delegates, including neurologists, physicians, junior doctors, nurses, physiotherapists, occupational therapists and speech therapists who were involved in stroke management in their day-to-day lives. The event had in-kind support from department of neurology, WesternHospital, Melbourne, Australia, National Stroke Foundation Australia, Anurdhapura Clinical Society, Ratnapura Clinical Society, Stroke Unit, BaseHospital, Diyatalawa, Sri Lanka, Department of Medicine, Faculty of Medicine, University of Peradeniya, Sri Lanka, which made this series a huge success. We had lot of positive feedback from the participants of this master class series in Sri Lanka. It was evident that there is a significant thirst at the grassroot level for knowledge of best practice in stroke care. We were invited to come back and repeat the event with further updates on regular intervals in the future by many of them. This implicates the necessity for more opportunities of this nature at a junction where stroke care in countries such as Sri Lanka are trying to keep pace with the rest of the world. Stroke Master Class audience, Teaching hospital, Peradeniya. There is no doubt that development of stroke services with whatever the resources available in less resourced countries like Sri Lanka is a top priority at the moment. This can be done and should be done. Reorganization of the services and education are the key factors that will get us toward this goal. Asia Pacific Association of Young Neurologists and Trainees plan to establish a master of stroke medicine program through similar stroke master class program and open book examination process with the help of Australasia Stroke Physician Network, World Federation of Neurology, World Stroke Organization with a view to address the burning issue of stroke care workforce in the Asia Pacific region as matter of priority in the coming years. If you are interested in helping us in this process or if you are interested in hosting the stroke master class series in your country, contact us via www.apaynet.org or email twi@unimelb.edu.au. Sirisena is director of the Department of Neurology & Stroke Services at Teaching Hospital, Anuradhapura, Sri Lanka, Wijeratne is director of Stroke Services and the Neuroscience Research Unit at Western Hospital and the University of Melbourne, Australia. 1. Wijeratne T, Gunaratne P, Gamage R, Pathirana G, Senanayake S, De Silva N, et al. Stroke care development in Sri Lanka: The urgent need for Neurorehabilitation services. 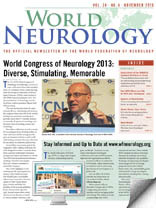 Neurology Asia. 2011;16(2):149-51. 2. Wijeratne T. Neurorehabilitation in Sri Lanka: an emerging sub-specialty for neurology trainees. Int J Stroke. 2012;7(2):163-4. 3. Gunaratne PS. A step forward in stroke care in Sri Lanka. International Journal of Stroke. 2009;4(4):293-. 4. Gunaratne PS, Fernando A, Sharma VK. Development of stroke care in Sri Lanka. International Journal of Stroke. 2009;4(1):38-9. 5. Macerollo A, Varga ET, Gyorfi O, Kobeleva X, Paterson RW, Sellner J. The European Association of Young Neurologists and Trainees in 2013: striking a blow for European junior neurologists. Eur J Neurol. 2013;20(4):e54-8. 6. Struhal W, Falup-Pecurariu C, Sztriha L, Sellner J. The European Asociation of Young Neurologists and Trainees: advocating young neurologists in Europe. Eur J Neurol. 2009;16(8):e146-8. 7. Struhal W, Falup-Pecurariu C, Sztriha LK, Grisold W, Sellner J. European Association of Young Neurologists and Trainees: position paper on teaching courses for Generation Y. Eur Neurol. 2011;65(6):352-4. The current state of the website was discussed. The principal function of the website beyond the “About Us” page is education. This section of the site is being effectively populated by the Education Committee. A major advance has been the addition of Facebook and Twitter by Walter Struhal, which are being used by more than 800 young neurologists to keep up with activities of WFN and to share neurological news and views. Two articles on the use of the website for social networking will appear in World Neurology, one in the current issue and one in the next. Including World Neurology as a seamless section of the website has added greatly to its attractiveness, and will help to keep it fresh. Exactly how World Neurology and the website will allocate and share content still needs to be determined, because it is possible to update World Neurology on an ongoing basis just as is done with the website. Several suggestions for future development were also discussed. There is an interest in exploring the possibility of advertising on the website. There are several ways to do this, but we would first need to obtain metrics about the use of the website: How often is it visited, how long do visitors stay, and what do they look at? Potential advertisers will pay for “eyeballs.” These data should be readily available. It was suggested that we be more proactive about linking to regional sites and member organizations. It would be good to have more geographical diversity in content as well. We had no takers when we offered to establish websites for member organizations that don’t have them, but we can make this offer again. Finally, password protected pages can be made available for committee work, but so far this service has only been used by the Education Committee. As committees are reformed for the new term, the chairs should be informed of this service and perhaps more will be interested in taking advantage of it. We would welcome comments and suggestions from the new executives and committee chairs as they are appointed. Present at the Meeting: Bill Carroll, Pete Engel, Chris Kennard, Keith Newton, Raad Shakir and Water Struhal. Donna Bergen, Wolfgang Grisold, Chiu Man and Don Silberberg had conflicting commitments. Johan Aarli (right) with WFN President Vladimir Hachinski. Alastair Compston is professor of Neurology and head of the Department of Clinical Neurosciences in the University of Cambridge and co-chair of Cambridge Neuroscience. He trained in neurology at the NationalHospital and the Institute of Neurology, Queen Square after graduating from the MiddlesexHospitalMedicalSchool with first-class honors. He is an outstanding editor of Brain, a past president of the European Neurological Society and of the Association of British Neurologists and past chairman of the Neurosciences and Mental Health Panel of the Wellcome Trust. Arguably one of the most respected and capable clinician scientists of his generation, his research has focused on the clinical science of demyelinating disease with contributions to the genetic epidemiology, immunology and neurobiology, and treatment and repair of multiple sclerosis (MS). In all areas, he has contributed substantially to the knowledge base with 335 original articles and research letters. Most notably, with Stephen Sawcer, he established the GAMES consortium and went on to develop a worldwide consortium aided by two North American groups leading to the 2011 Nature publication involving almost 10,000 PwMS and more than17,000 controls, which expanded the known MS susceptibility loci to 57 and which overwhelmingly implicated T-cell driven immunity in the pathogenesis of MS. In MS therapy, he was crucial with Alisdair Coles in using Alemtuzumab and showing that in relatively early MS, relapse activity and progression could be prevented and disability improved by lymphocyte ablation even though in more established MS progressive disability continued despite relapse activity being terminated. Both of these observations are now critical to the current approach to MS treatment. In both the Genome Wide Association Screen and Alemtuzumab initiatives, colleagues have said these would not have happened without Alistair Compston. His incisive mind, broad experience, clarity of expression and quiet courteous manner underlie his ability to gather first-class colleagues and key collaborative groupings from around the world to aid his many successful achievements. His work has been recognized by international awards: the Sobek Prize (2002), the Charcot Award (2007), the Zulch Prize (2010), the McDonald Award (2011) and now the World Federation of Neurology Medal for Scientific Achievement in Neurology (2013). When the history of the solution to MS is finally written, Alistair Compston will figure as a principal contributor. The organizers of the World Congress in Vienna have decided to award a special “one off” Lifetime Achievement Award to a most deserving person, who has truly spent his life in the service of neurology in his native Austria, the Danube region, in Europe and globally. It is quite astonishing to realize that he was the secretary of the World Congress of Neurology here in Vienna as long ago as 1965. Franz Gerstenbrand qualified from Vienna in 1950. Following training, he became associate professor in 1967, head of the department; Rosenhügel, Vienna, and Innsbruck in 1975. His work in his native Austria is impressive. He was head of the Institute for Restorative Neurology and Neuromodulation, Ludwig Boltzmann Society from 1995-2006, and head of the Scientific Institute for Neurorehabilitation and Space Neurology; Karl Landsteiner Scientific Society up until 2009. He holds many honorary doctorates; Charles University Prague, Danube University Krems , Aristotele University of Thessaloniki. His regional achievements are most impressive. The most prominent is the bringing together the Danube and Eastern European neurologists at a time of political difficulties. He was a founding member and now is honorary president of the Danube Symposium for Neurological Sciences, and later the International Danube Neurology Association of Central and East Europe. His involvement with the WFN started in 1965 and has continued ever since. 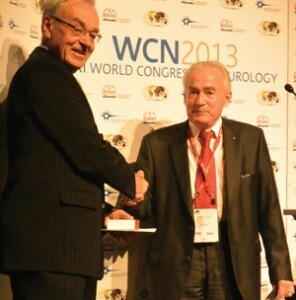 He is chairman of the WFN Research Groups on Neuroethics and of Space and Underwater Neurology. He is also a member of several other research groups. 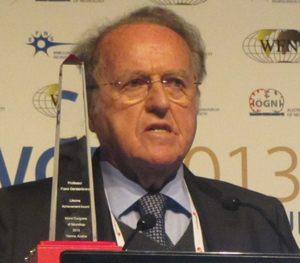 He holds honorary memberships of several neurological societies: Russia, Poland, CzechRepublic, Hungary and Myanmar. His work in Myanmar exemplifies his personality and diligence to help neurologists in all parts of the world, especially those living under difficult political regimes. He is the author of hundreds of papers and 12 books. As far as I am aware, he is the only neurologist who is a holder of the Valeriy Gagarin Medal of the Russian Space Organization. 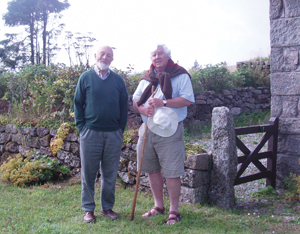 Alan Emery (left) with the author on Dartmoor in Southwest England. This neurohistory column in World Neurology bears witness to the fact that there is increasing interest in medical history as a specialty. Many medical journals, and some textbooks, including Bailey and Love’s A Short Practice of Surgery, carry references to the history of the specialty that has always provided an intriguing glimpse of another world. Medical books and journals often discuss the history of their subjects and over recent years dedicated medical history publications have appeared and explore the subject in depth. The Journal of the History of the Neurosciences is a specialist journal edited by Peter Koehler and others and, coupled with book publications and some series of specialist history volumes, now provides a good platform for aficionados of neurohistory. The teaching of medical history may rely upon three principal aims. The first is that it is necessary to look backward in order to understand how we have arrived where we are now and, ideally, to avoid treading the same pathway in the future where that pathway may be problematic. In other words, we learn from experience, or at least we should do so. The second is that it should be an academic discipline bringing, to the rigor of thinking, a proper academic approach to the gathering and sifting of information, and to making judgments and leading thereby to new pathways forward; a sort of dialectic where the thesis, antithesis and synthesis form a triad, each synthesis becoming a new thesis. The third is that it should be fun because things that are fun and interesting tend to capture the imagination and spur us to move forward. Perhaps this column will help achieve these aims and foster further interest in what we do and what we should do and also encourage others to join a happy band of new-age explorers. The basis of any specialty is the people involved. Thus biography needs to come first. There are arguments for exploring the life history of those who contribute to a topic and biographies of neuroscientists abound. Some have achieved great things in a speciality, some have achieved great things in parallel fields including writing and some have become failed eponymists, those who have discovered things but whose name has not been attached to the discovery. In the first group are many whose names we know from the neurology of long ago (Willis, Broca, Duchenne, Charcot, Gowers, Hughlings Jackson, Head, Critchley, Brain and others) and we can write of them. Fascinating books and papers abound, and there are many lessons to be learned from these earlier days of neurology. Thus biography grips us all, and we like to learn of the lives and experiences of our forbears. In the second group, we can be fascinated by the writings of Oliver Wendell Holmes, Arthur Conan Doyle, Somerset Maugham and in our own time Oliver Sacks, among others. Some have become medical truants. Some have written poetry (Dannie Abse) and some of the writing leans toward the neurological. In the third group, we can include Edward Meryon who described the dystrophy attributed subsequently to Duchenne, now often styled Meryon’s disease. Many neurohistorians are collectors of books. A great worry nowadays is that since so much published on the Internet will not reach permanent paper form, the availability of publications has become greater but the ability to browse has become harder and the long-term storage of important information may fail in content and in recall. The wealth of electronic publication flying through the ether, often not peer viewed and published indiscriminately, complicates matters. Dusty old books give a pretty clear indication of the thinking of our forbears. Eponyms are often much easier to recall than disorders classified by number. Collections of books in a sense comprise a museum. Specific neurological museums are uncommon, but many museums are dedicated to medical history, including the Berlin Medical Historical Museum and Virchow’s collection at the Charité, and the marvellous wax-work anatomical museums at La Specola in Florence and at the Josephinium in Vienna, the work of Joseph Towne (1806-1879) at Guys Hospital, the wax embryos at the Whipple Museum of the History of Science in Cambridge, and elsewhere. Those who state that dissection of real anatomical material is no longer necessary in the medical course are justified by some extent by the beautiful wax models that provide a three- dimensional view of the brain and the nervous system. Plasticized cadaveric material and plastic models can be quite lifelike but old timers believe dissection of real tissue is still needed. Nevertheless, today’s emerging doctors seem none the worse for having grown up without classical dissection. But it is still people who matter and who shape the future. So far we are not ruled (wholly) by computers and robots so we can make decisions and determine, or so we think, our own destiny. Neurologists might question this, believing that studies of the contingent negative variation indicate that something we think we have thought up, conjured from our own minds, is original whereas perhaps we are just made aware of some primitive activity that is programmed and not initiated voluntarily. Maybe we do not have an original thought in our heads. Maybe Jung’s collective unconscious in some way controls what we do, a sort of science fiction that has become science fact. Just as we do in the investigation of malpractice claims, we must judge, if judge we must, on the basis of what was happening at the time of relevant prior events. In the future, others will ask whether in the 21st century we really did administer poisonous chemicals by mouth and by injection, whether we really did open up the body with a scalpel or the skull using a drilling machine, why we did even approach an organ (brain, heart, bile duct) by the natural tube (artery, vein, gut) that led to that organ in order to probe, enlarge, coagulate and coil, instead of heaven knows what alternative might become available instead. We can write of those teachers who are no longer with us. For each of us, those teachers who are living now know who they are and what good influence they have had on our practice and for which we thank them. 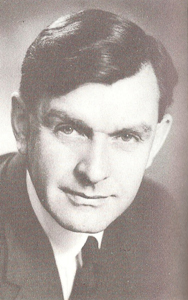 Stanley Graveson described himself as a jobbing neurologist, and this meant helping vast numbers of patients over a wide geographical area in the region of Wessex in the South of England. The stories told by colleagues and teachers regarding their experiences and research continue the stream of knowledge of what went before and of why we are where we have arrived today. To arrive toward the end of a career in neuroscience with such a long and hard-working track record, with the ability to believe so many patients have been helped, is the aim of all, the best legacy topped by study and discovery, reading and writing, with continued learning and teaching each in our own neurological field. Gardner-Thorpe is a consultant neurologist and editor of the Journal of Medical Biography. Almost 80 Delegates and representatives assembled in Vienna on Sept. 22 for the Annual General Meeting of the Council of Delegates. They arrived for registration to be greeted by a colorful oriental display from the three cities bidding to host the 2017 World Congress of Neurology — Hong Kong, Kyoto and Seoul. The importance of the occasion was evident to everyone, even more so because, in addition to the selection of the WCN 2017 venue, Delegates chose three new officers and one new elected trustee. As well as presentations from the three member societies, Delegates heard an assessment from the Federation’s Professional Congress Organizer (PCO) and received reports from members of the site visit team to help them make up their minds. It was a difficult choice but eventually Kyoto won the day. Just as keenly contested were the elections for officers and trustee, where 11 highly qualified candidates from across the globe stood for president, first vice president, secretary-treasurer general and elected trustee. All of them addressed the assembly to present their vision and goals if elected. Ballot papers were collected and counted outside the meeting by Keith Newton, WFN executive director, with assistance from Tanja Weinhart, Austrian Society executive secretary, under the close supervision of Professor Johan Aarli, WFN past president and Professor Marianne de Visser, EFNS vice president. At the conclusion of the meeting, the results were announced. Delegates also received reports from officers and committee chairs, including chairs and co-chairs of the Education and Applied Research Committees. The former gave a PowerPoint presentation of the activities of the Education Committee, including the development of standard operating procedures for committee activities, such as the monitoring of educational grants; departmental visit programs; and teaching center accreditation. Donna Bergen, chair of the Applied Research Committee, reported that new Applied Research Groups have been established on coma, neuro-oncology and neuro-infectious diseases. The Membership Committee proposed a category of Pending Membership to speed up the process of assimilating new societies into the Federation. Only voting rights will be temporarily withheld until all formalities are completed. This year, three new societies joined the WFN — Oman, Tanzania and Uzbekistan — bringing the total number of neurological associations in the organization to 117. By common consent, the Vienna Congress was a resounding success. Planning for Chile 2015 has already begun; Kyoto is our destination in 2017; and members are now urged to think ahead to 2019, when we return to the region of Africa or the Middle East for our biennial World Congress of Neurology. The 2013 intake of doctors training under the APFP program. Roland Ibekwe from Nigeria (a) and Edward Kija from Tanzania (b) are the current child neurology trainees. Other members of the group are training in diverse paediatric specialities from gastroenteritis to paediatric intensive care from many different countries in Africa including Uganda, Kenya, Zambia and Malawi. The World Health Organization recommends a minimum of one adult neurologist per 100,000 of the population. The same group also reports that 10 percent of the pediatric population suffers from some form of neurodisability. 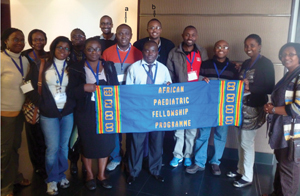 The African Pediatric Fellowship Program is a project developed by the University of Cape Town to build skills capacity of health practitioners from Africa. Tertiary centers across Africa are assisted to develop strategic plans based on their countries’ key health care needs. Collaborating centers recruit teams to build skills and resources. Structured training occurs at the pediatric units through the University of Cape Town. More than 55 specialists have completed the training program in diverse pediatric areas with a 98-percent retention rate of returning to work in their home countries since 2008. The program is evolving with training arms that support nursing and ancillary services. Referring centers are encouraged to develop their own training modules as their trainees return, as such creating further training nodes across the continent. The trainee becomes the trainer in his or her home center, and a key opinion leader equipped to lobby for changes to health care policy. The WFN provided a grant to support the program in 2011 over two years. Focused training has or is being provided to six general pediatricians from different centers in Nigeria, who manage large case loads of children with neurodisability and often epilepsy. A key area of need identified by these doctors is the challenge of providing good care for children with epilepsy — centers lack the ability to perform and interpret EEG effectively and are not skilled in the clinical management of children with epilepsy.2 The University of Cape Town is in the process of developing a post-graduate diploma in “Pediatric Electrophysiology Interpretation and the Management of Children with Epilepsy.” This requires one-on-one training with a focus on areas relevant to the African context. The course should be available early in 2015. Three doctors have been identified from Nigeria, Tanzania and Ghana, who at the request of their tertiary centers, are commencing formal training to be accredited child neurologists. Currently, Nigeria has 17 doctors with an interest in child neurology. (They are general pediatricians managing large numbers of children with neurological disorders.) Tanzania has no accredited child neurologists, and Ghana has two. Another trainee from Sierra Leone, which lacks both pediatricians (approximately eight in the entire country) and child neurologists (none), has been identified to train initially in general pediatrics and then to follow with developing relevant child neurology skills. This doctor started his pediatric training initially in Malawi in March 2013 at the Queen Elizabeth’s Children’s Hospital in Blantyre — a center with an exceptional general pediatric curriculum. After two years, he will transfer to complete his training in South Africa in our center. This system of developing other training nodes across the continent is the logical course to follow as it will build capacity to train more specialists. A goal of prevention and early intervention is one of the major aims for this project. As such, the training is being developed to ensure that trainees return equipped with the concept of addressing health needs across all levels of health care. (They complete a “Transition and Translation of Knowledge module.”) They are expected to look at protocols, approaches and capacity to deliver health care from the primary health care clinics through to tertiary. While one person cannot address all of these needs, they can assist in the development of teaching programs whereby they train health care workers in safe and effective practice. Building teams is essential. The program has a separate arm that focuses on nursing training, and the latest direction (the “third arm”) will be to develop ancillary services (namely physiotherapy, occupational therapy, speech therapy and so on). The benefits from these collaborations cannot be underestimated — there is much to learn from the approaches many innovative African centers undertake to cope with the challenges of scarce resources. The clinical skills of these doctors are exceptional as this and history taking are often all they have access to. 1. Wilmshurst JM, Badoe E, Wammanda RD, Mallewa M, Kakooza-Mwesige A, Venter A, Newton CR. Child neurology services in Africa. J Child Neurol. 2011 Dec;26(12):1555-63. Walter DeWitt Shelden was born Feb. 2, 1870, near Windom, Minn., He grew up in Reedsburg, Wis., and graduated from the University of Wisconsin in 1891. He attended RushMedicalCollege in Chicago, spent two years as an intern at CookCountyHospital in Chicago and worked as a general practitioner in Reedsburg for four years. He then received internal medicine training at the University of Vienna for 1.5 years, and for the next 10 years had a lucrative private internal medicine practice in Minneapolis and taught at the University of Minnesota Medical School. 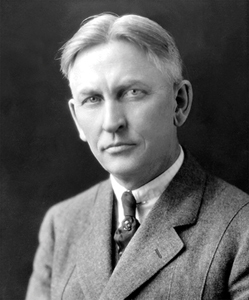 Shelden was asked by William J. Mayo to start the neurology section at the Mayo Clinic in 1913. He was head of the neurology section at the Mayo Clinic until 1930, and died on Feb. 13, 1946. Walter DeWitt Shelden, MD. Photo courtesy of the Mayo Foundation for Medical Education and Research. medical study at Vienna between 1870 and 1914. Almost the entire post-graduate work in Vienna was given in the Allgemeines Krankenhaus (2,250 beds in 1912). University of Nebraska Press, 1963).” Viennese clinicians were quick to encourage and exploit the interest of foreign doctors. Short practical courses of four to eight weeks were offered in the clinical branches of medicine, each limited to 10 or 12 students. In addition, adjunct professors and instructors arranged private courses. The internal medicine course given by Kovacs was controlled by Americans through a self-perpetuating membership. re’s disease and neurogenic bladder (Lesky E. The ViennaMedicalSchool of the 19th Century. Baltimore: The JohnsHopkinsUniversity Press, 1976). Edmund von Neusser, MD. Photo courtesy of the National Library of Medicine. 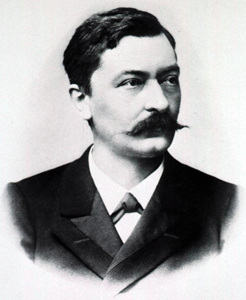 Von Neusser (1852-1912), professor of internal medicine at the University of Vienna, was a master of diagnosis and differential diagnosis. Rumor had it that Neusser sent 140 patients to the dead-house without an error in diagnosis (Herrick JB. Memories of Eighty Years. Chicago: University of Chicago Press, 1949). Von Neusser had an active interest in diseases of the nervous system, and studied neurology in France, but did not become a specialist in neurology. He was “master of the whole of internal medicine” (Lesky, 1976). These trips to Vienna by Americans were criticized by some, but most of this criticism was directed at those without prior internship and practice experience who had short stays, partied too much, did not speak the native language, and/or came after World War I. None of these things applied to Shelden. Interestingly, most courses for Americans in Vienna were in English, but Shelden learned German there. Learning the language was one of the reasons his mother encouraged him to go to Vienna. Shelden translated German articles for an American neurologic journal later in his career. Shelden’s training in Vienna honed his clinical skills, exposed him to scientific medicine at the highest level, and had a significant influence on his subsequent medical career. His student Henry Woltman stated that “when the consultants gathered ‘round the autopsy table in the deadly game of turning face-down on the table a card bearing their name and diagnosis, Dr. Shelden was almost always right,” reminiscent of rumors of von Neusser’s diagnostic accuracy. Shelden exemplified the benefit of post-graduate training in Vienna before World War I for the well-prepared American physician. Boes is an associate professor of neurology at the Mayo Clinic in Rochester, Minn.
Stay Informed and Up to Date at www.wfneurology.org.